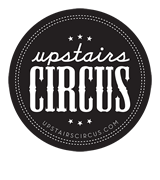 Create, Drink and Be Merry™ with Upstairs Circus at a Project Social! Come Join the Circus and choose to make one of our 30+ DIY Projects on the current Spring Series Project Menu while enjoying libations from our full bar. From leather working, jewelry making, woodworking, art and more, you'll be sure to find a Project to make, learn a new skill from, and have a magnificent time doing it. Make new friends, enjoy refreshing libations, and leave Upstairs Circus with a spectacular masterpiece! 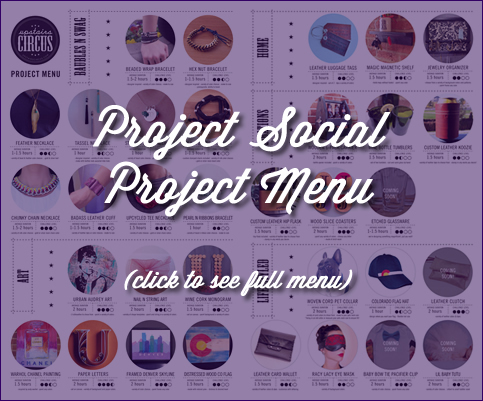 With your Project Social seat you can make ANY project from the Upstairs Circus Project Menu. Choose, customize and socialize. Each person in your group can choose whichever project they would like to make (each persons' project can be different) and sit together while making them. Cost: $38 per person, no matter which project you make. Cocktails not included unless noted. Tips not included (15-20% tip recommended). Tab stared upon check-in. Curious what a Project Social is? Learn more here! Please note: At Upstairs Circus, we have a flexible arrival time. If your Project Social is scheduled to start at 7:00, you are able to arrive anywhere from 6:30 to 8:00pm. You will be asked what time you would like to arrive while making your reservation. - Reservations are not pre-paid tickets. All seat reservations require payment at time of your Project Social. - All seats in your reservation can be paid for individually at the time of your Project Social. - You can reschedule your reservations or change the number in your party up to 24 hours in advance of the Project Social you are scheduled to attend. - For parties of 8 or more, we will call you to collect credit card information to hold your reservation. Each guest can pay separately upon arrival. - Reserved seats are for customers making projects. There is a one project purchase requirement for all reserved seats. - Reschedule or make changes to your reservation by following the instructions to do so in your confirmation email or by calling us at 720-722-2105. Please provide us with the date you are currently booked, the name on the reservation and what changes you would like to make when calling! - For larger groups or special events, please see our Groups & Events page -or- call our groups and events line at: 720-722-2105.